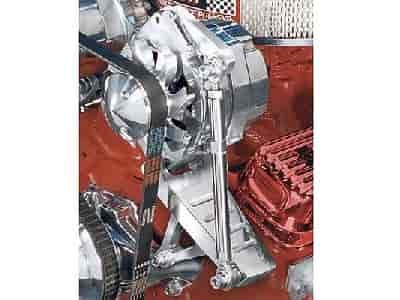 The March Performance Alternator Brackets give you the option of mounting your alternator in several different positions, depending on your requirements. Available in durable steel or CNC-machined solid billet 6061-T6 aluminum, these alternator brackets will provide an accurate fit and will easily handle high torque and vibration. The solid billet aluminum brackets are powder coated clear or silver for durability and to eliminate the need of polishing hard-to-reach places. High Performance steel brackets have a chrome plated finish. Deluxe and Ultra brackets have a clear coat finish. Custom brackets have a silver powder coated finish.